An ISO file is an image of a DVD or CD. In order to use its contents, you need to mount the ISO so that your computer can treat it as another disk drive. These instructions tell you how to install the necessary software to Mount the ISO. Can you Mount the ISO file? First, you want to know if you have a utility for mounting the ISO file or not. 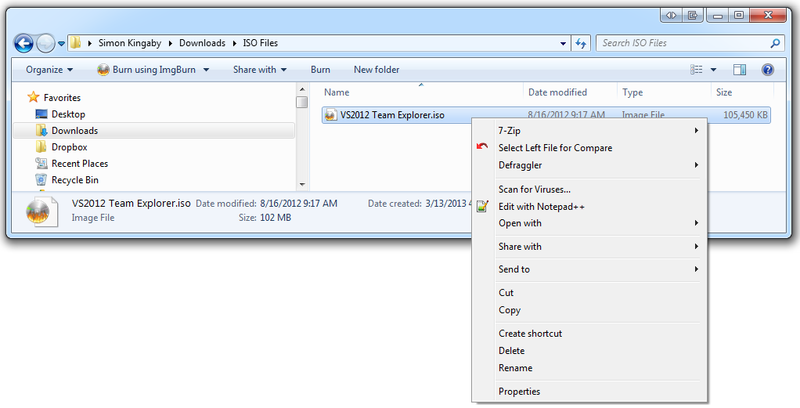 In Windows Explorer, right-click on the ISO file and see if you have an option to Mount the file. If you do not see a Mount option, as shown above, you will need to install a utility such as MagicDisk or Virtual Clone Drive. The setup file for Virtual Clone Drive is available at http://static.slysoft.com/SetupVirtualCloneDrive.exe. Now that Virtual Clone Drive is installed, you can mount the ISO file. Warning: If you are working with an ISO file on a network drive, copy the file to your local desktop or using the ISO will be very slow. Select Mount (Virtual CloneDrive E:) Note: Your particular machine might not use E:, it could use F: or X: or any drive letter. The ISO is now mounted as the E: drive (or whichever letter was selected when you chose the Mount option in step 2. Now the ISO is mounted, you can access the files inside it. Typically this will be a setup.exe or other .exe file on the newly mounted E: drive. Locate the file and double-click it to run it.